With the newly developed Airback Plus KHS Corpoplast has taken another significant step towards creating even more sustainability and cost reduction in the manufacture of PET bottles. With the help of the new system, up to 40% of the compressed air used in the stretch blow molding process can now be directly ‘recycled’ in the blowing wheel instead of the previous 10%. Airback Plus is used in conjunction with the Airback I process, already familiar to and established on the market. 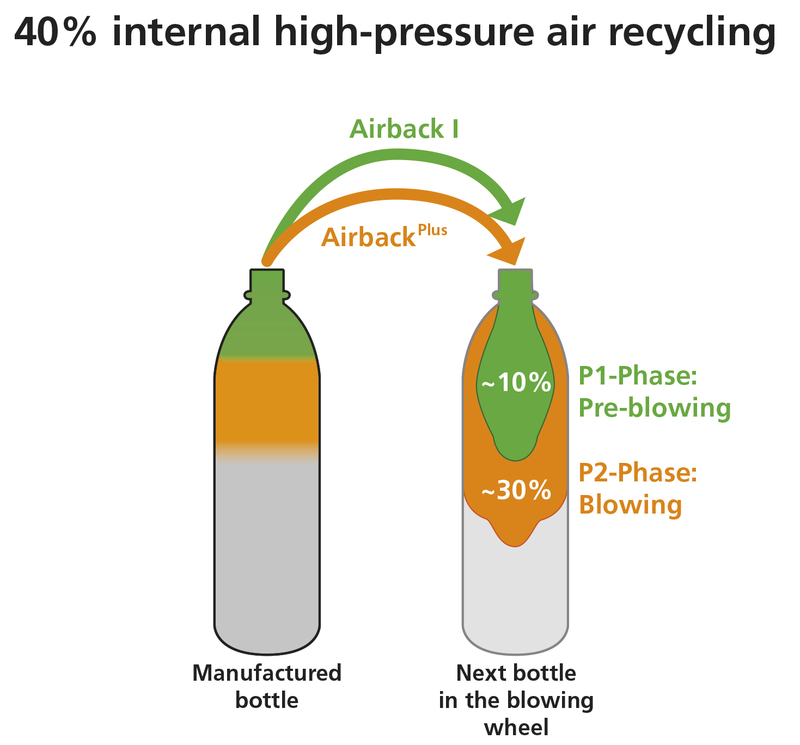 With Airback I, the quantity of compressed air which is present in a newly produced bottle and which is required for blow molding the next bottle is fed into a ring line located at the centre of the blowing wheel. From here it passes directly to the preform, enabling savings in compressed air of around 10% to be made. The pre-blowing phase (PI phase) is followed by the blow molding of the bottles at high pressure (PII phase). In the Airback Plus process more compressed air which can still be used is extracted from the manufactured bottle. This is supplied to the pre-blown container at a higher pressure (interim pressure stage), achieving an additional saving in compressed air of up to 30%. Another advantage of using Airback Plus is that less energy and a lower volume of high-pressure air are required for the stretch blow molding process than was previously the case. The compressor can therefore be smaller, resulting in reduced investment costs and ongoing cost savings through fewer spare parts and reduced maintenance costs and effort being required. The Airback Plus is not only an option when it comes to investing in new KHS Corpoplast stretch blow molding equipment. The system can also be retrofitted into existing InnoPET Blomax Series IV and InnoPET Blomax Series III stretch blow molders. The chief aspect of Airback Plus, however, is that the premium bottle quality provided by KHS Corpoplast stretch blow molding machines is ensured in every respect. What’s more, InnoPET Blomax Series IV stretch blow molders have an output of up to 2,250 bottles per hour and cavity.